If you have any questions or want to enquire about dates, use our form to contact Mark & Kep Forbes or see their website for more information. Coast down the steep winding lane to a 1760s mill house in a woodland setting. Trebarwith’s spectacular beach – all surf and sand – is a ten-minute walk away. It’s quite a spot. Back at the inn, the bar combines the best of Cornish old and Cornish new: big flagged floor, wooden tables, chapel chairs, two leather sofas by a wood-burning stove. The swanky dining room overlooking the burbling mill stream is light, elegant and very modern. Settle down to some rather good food: firecracker prawns; fillet of sea trout with crushed potatoes, kale, roasted banana shallot, mussel & tarragon cream; coconut panna cotta, torched pineapple, rum sponge. Bar meals are more traditional, they do great barbecues in summer and (be warned) a band often plays at the weekend. In keeping with the seaside setting, bedrooms are simple and uncluttered, with good shower rooms in the smaller standard rooms. If you stay in the little cottage be ready for a steep staircase. Coastal trails lead to Tintagel, official home of the Arthurian legends, there’s biking, surfing, crabbing… you couldn’t possibly be bored. Guidance on local walks. 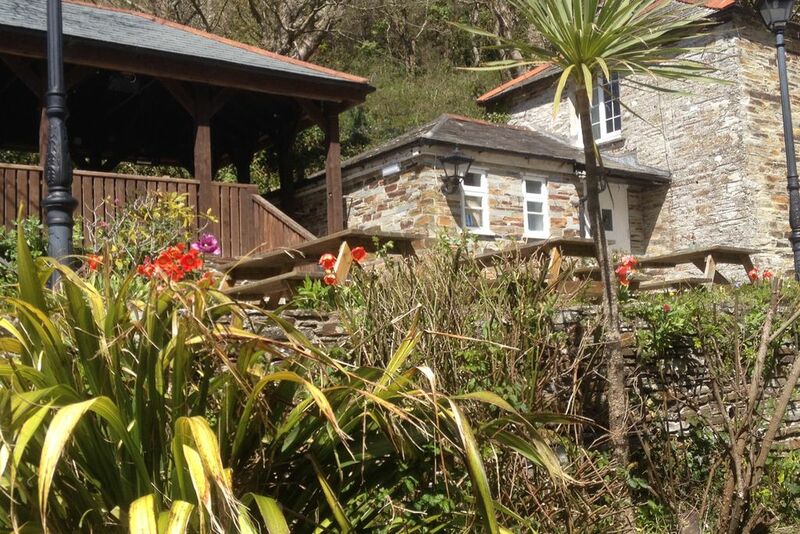 Doc Martin's dog Dodger stays here! Dogs to be kept on a lead please. Singles from £56 to £97. Dinner, B&B from £60 to £90 per person. Extra bed/sofabed available £20 per person per night. Just spent a fantastic New Year with my wife and boys (11 and 8) plus sister and brother-in-law at the fantastic Cornish bolthole The Mill House Inn just outside Tintagel. A jumble of a dozen or so super comfortable rooms above the bar/restaurant it's a Sawday's gem! Four courses of gastro dining including guinea-foul and sea-bass would not have gone amiss at a top London eatery. The best part of the celebrations was the band: think Motorhead (RIP Lemmy) meets Mumford and Sons for a cacophonous fusion of thrash metal and blue grass refinement. Will be back for more Cornish delights! Very nice rooms, delicous dinner and breakfast, a few minutes to go to Trebarwith Strand, where we had a sensational sundown. Very nice and friendly service - can really be recommended! 5 minutes drive to Tintagel, where you will find the castle and everything you want to know about King Arthur. 15 minutes drive to Port Isaac, where Doc Martin is still being filmed and the Fishermen's Friends regularly perform. Play our unique 'loop' game in the bar to either be elated or totally frustrated! Visit the National Trust Centre in nearby Boscastle to find out more about the amazing rescue stories during the floods in August 2004.